Elizabeth Warren: Have tech companies become 'too big to fail'? Senator Elizabeth Warren just insulted Silicon Valley in the worst way: She compared some of the biggest tech companies to banks that caused the financial collapse. 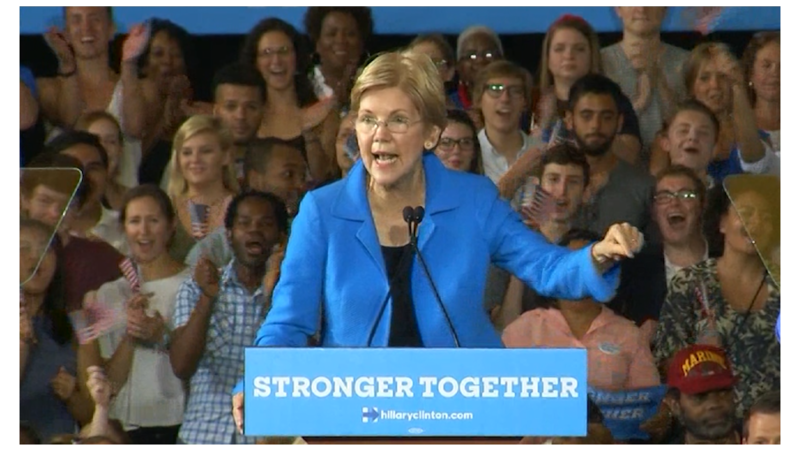 "[The] idea of 'too big to fail' in the financial sector gets a lot of attention," Warren said in a speech on Wednesday. "But the problem isn't unique to the financial sector. It's hiding in plain sight all across the American economy." Her remarks were delivered during an event for New America, a public policy think tank in D.C. In addition to going after Walmart (WMT), CVS (CVS) and other large corporations, Warren specifically called out Google, Apple and Amazon for anti-competitive practices. The FTC has investigated Google (GOOGL) for favoring its own services on its search engine over those of its rivals, she said. The FTC is also looking into Apple's (AAPL) practice of creating rules that make it hard for streaming media services to compete with Apple Music. And a large group of authors are accusing Amazon (AMZN) of directing customers to buy books from its own publishers and taking a growing cut of their profits. Each company deserves "to be highly profitable and successful," said Warren. "But the opportunity to compete must remain open for new entrants and smaller competitors that want their chance to change the world again." Representatives for each company did not immediately respond to requests for comment. Warren has been shifting her ire from Wall Street to Silicon Valley lately. It's a particularly interesting time for her to do this since she's on the shortlist of Hillary Clinton's VP candidates. Just this week, Clinton has been trying to woo more Silicon Valley types by laying out a five-part tech agenda. Among Clinton's goals are to increase investments in computer science education and provide high-speed Internet to everyone in the country. But part of her agenda also involves creating rules that promote more competition and innovation.